Adam Ridley (Open Singles winner) and Rana Raseem, winners of the Handicap Doubles playing against Reem Rassem and Eve Witterick. 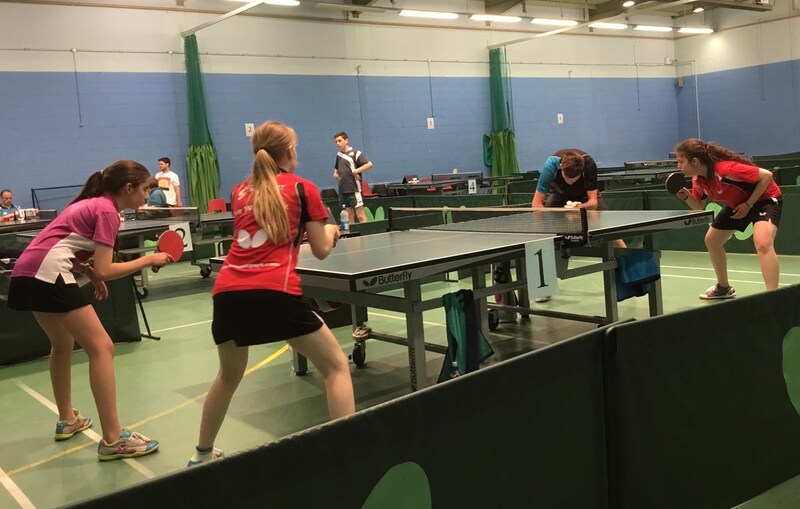 Adam Ridley was the surprise winner of the Cleveland & District Summer Table Tennis League Championship that was played at the Ormesby Club last weekend when he beat one of England’s top cadets, Thomas Raynor, in the final after saving five match points. Thomas Raynor appeared to have the championship in the bag, when he led by 2 games to 1 and by 10-7, so giving him three match points. Adam Ridley recovered to deuce, Tom Raynor had two more match points before Adam Ridley clinched the fourth game at 17-15 and went on to win the decider at 11-8. Adam Ridley beat another Ormesby Junior, Chrissy Edwards, in three straight games in the semi-final, whilst Tom Raynor beat the veterans champion Gary Whyman by 3-1 in the semi-final. Adam Ridley won three titles in total, adding the Handicap Singles and Doubles to his haul. In the Singles Adam Ridley beat Ben Savage in the final by 21-17 in the decider whilst in the Doubles Adam Ridley partnered Rana Rassem to beat Issy Doyle and Daniel Bennett at 21-16 in the third game in the final. Despite losing the Open Singles final, Raynor had a good tournament beating Edwards in straight games to win the Junior Title and Ben Savage also in straight games to win the Cadet Singles. The second division Singles was won by Tommy Webster of Northfield who beat Tom Hand by 3-1 in the final. The Wheelchair Singles was won by Noel Thomas who defeated Mark Bonnar by 3-1 in the hard fought final.